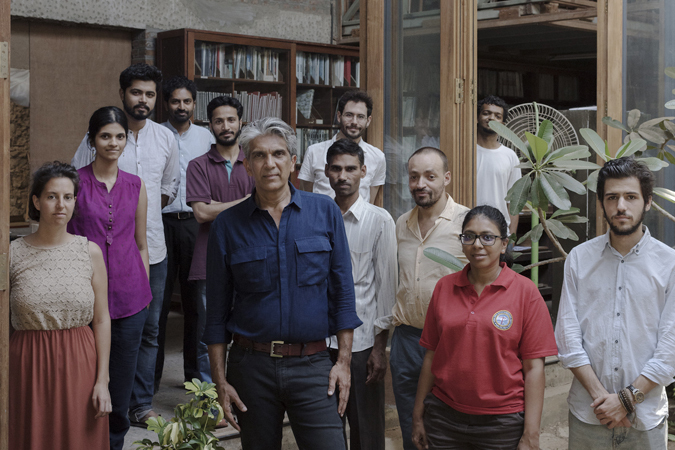 Founded by MPavilion’s 2016 architect Bijoy Jain, Studio Mumbai is unlike any other modern architecture practice. The studio works with local artisans, craftspeople and draftsmen to design and build projects through an explorative creative process. This includes large scale mock-ups, models big–and–small, material studies, sketches and drawings. The studio’s projects are developed with careful consideration of place and practise while drawing from traditional skills, local building techniques and materials, and the ingenuity that arises from limited resources. The studio’s collective expression in built form—and so too Bijoy Jain’s practice—is deeply informed by the concept of ‘lore’, a body of traditional knowledge passed on by word of mouth. The studio’s philosophy of local collaboration and sensitivity to the landscape and environment is manifest in its stunning headquarters in Alibag (a semi-rural area south–west of Mumbai) and will be similarly but uniquely expressed in MPavilion 2016. Studio Mumbai’s distinctive process and ethos, from conception to built form, has garnered wide-reaching admiration. The studio presented at the XII Venice Biennale and the Victoria and Albert Museum in London and has received awards including the Global Award in Sustainable Architecture 2009; Finland’s Spirit of Nature Wood Architecture Award 2012; the BSI Swiss Architecture Award 2012; and the Grande Medaille d’Or 2014 from the Academie D’Architecture in Paris. MPavilion welcomes Studio Mumbai’s Bijoy Jain as its architect for MPavilion 2016.